The Magical Islands of Pembrokeshire. The islands around Pembrokeshire are of outstanding beauty and are home to many thousand birds. The most visited is Skomer Island, where there are boat trips running every hour from Martins Haven to the island. Some of the best diving to be had is around Skomer Island. The Island is home to a variety of wild life, such as the Grey seal, Puffins, Razorbills, Choughs, Guillemots, Kittiwakes, Fulmars, Gulls, and many more. You may also see Dolphins or Porpoise`s playing in the waters. The area is a nature reserve, and nothing is to be taken from the sea bed. A boat from the reserve patrols the area. In North Haven there is a protected bed of Eel grass, and is not to be disturbed. This breeds young eels on which the Puffins feed. The Island can be visited, on which the warden should be called, their call sign is Skomer one. Mooring is possible on the slip on the right as you enter the Haven. South Haven on the other side, has good anchoring ground, but there is no access to the Island. In South Haven a number of Seals have been seen, and is a wonderful place just to stop and watch these playful creatures. Jack Sound lies between the mainland and the Island, and the waters can be turbulent, and care must be taken. There are a lots of overfalls and low lying rocks just under the surface, which makes for some rough water at times. The Island and surroundings are a Marine National Park and are managed by wardens which base themselves at Martins Haven. The rules are that you look but do not touch. Boats should keep there speed down when approaching the cliffs as not to disturb the nesting birds. Keep away from the seals especially in September when it is the breeding season. If the seals approach you underwater, just enjoy it as you are in their world and they WANT to play with you, fantastic! The first Island outside the Haven after passing St Ann's Head. She is separated from Skomer by the Wild Goose Race. There is a lighthouse on the western headland, and the sea extends 3,000 miles ahead of you, and the first land you will come across would be the coast of the USA. The houses on the Island were restored by Mr Lockley in 1927 when he came to live on the Island. He used the wood from the wreckage of the Alice Williams, a 132 ton topsail schooner. It was abandoned by the crew after she was blown with full sails up onto the rocks. The cargo of coal was also salvaged and put to good use, as was many other items from the wreck. The figure head of the Alice Williams was placed over South Haven to greet all who came to the Island. A colony of seals can be found on the East side of the Island in a small bay. The first bird observatory was established on the Island in 1933. Good shelter can be found around the Island for diving, on any state of the wind. On the east side you can swim in a small bay where there are a colony of Grey Seals. For more information on these beautiful islands, visit this site. Skomer Islands. The Island is a RSPB reserve, covering 600 acres. The main attraction however are the Grey Seals, which about 400 pups are born each year. The Island also has the largest breeding colony of Lapwings in Wales. Sheep are grazed in the north east of the Island. The peaks of the Carn Llundain, and the Carn Ysgubor have fine views across to South Bishops Rock and the Bishops and the Clerks. Below the Carn Llundain there is a cliff where there are thousands of seabirds, including Kittiwakes, Fulmars, Razorbills and others breed. In late summer and autumn the first of the young seal pups are born. The eastern side of the Island are the treacherous waters of Ramsey Sound, one of the strongest tides in Britain, and bringing many vessels to their grief. 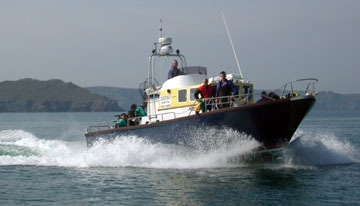 A boat service from the lifeboat station at St Justinian runs to the Island from Easter to the end of September. The Norsemen called it the "Grass Island". She lies some 50 min away from Little Haven, 9 miles out to sea. The Island can be seen (and smelt) for miles, as a white blob out to sea. It is covered with a colony of Gannets, some 33,000 breeding pairs, making it the second largest Gannery in the world. A hundred years ago there were only twenty gannet`s nest on the Island. In 1890 there were half a million puffins on Grassholm but they have all but disappeared. An Island half way out to The Smalls, and not often dived due to the fact that if the weather is good, most boats would head for the Smalls, another group of Islands further out to sea. The Island have been lived on by the Monks for over a thousand years. The old church being built by the Benedictine Monks in the 12th century. In 1906 the Island was sold to Father Aelred who built the present Abbey. There is much to do on the Island, so you might need to spend a whole day exploring. There are a few beaches, the safest of which is Priory Bay. There is a 550 acres of farmland that the Monks rely on for producing there needs, such as milk, butter, ice-cream, cheese and cream. A lighthouse stands on the highest point of the Island and offers splendid views of the Island and Tenby. The Island is a nature reserve, and landings are not permitted. The Island has the largest colony of Cormorants in Wales. On the cliffs are kittiwakes, guillemots, razorbills, and some pairs of puffins. The Island has shrunk over the years, due to the extensive mining for limestone, the quarries of which can be seen today. A group of rocks 23 miles out to sea from the coastline of Pembrokeshire. On these rocks is the Smalls lighthouse and can been seen at night from Broad Haven. Excellent diving can be found around these rocks, with many wrecks. The best attraction of all are the seals, where they lie in wait for you to enter the water. They are very playful and there will be two or three seals with you most of the time, guaranteed!